Meet Roy Cooper, stoic, unassuming “errand runner” for various New York criminals. Roy arrives in Los Angeles to shoot a man named Martin Shine a week after a powerful earthquake has knocked out cell service, buckled the freeways, and thrown L.A. into chaos. Roy doesn’t know who Shine is or why he has to die, but he does his job and does it well. Except for one thing: after the hit, Roy can’t find where he parked his car. Wandering the streets of North Hollywood, he stumbles upon a jogger getting mugged and beaten by four young gangbangers. Despite his attempt to simply put his head down and walk away, Roy winds up in the middle of another killing. Things get more complicated when the murdered jogger turns out to be a controversial mayoral candidate. Roy himself is shot twice, hospitalized in critical condition, and mistaken for a hero when a local resident leaks a video that goes viral. Now meet the rest of the cast of characters, including Kelly Maguire, a disgraced LAPD detective with an anger management problem and strange feelings about L.A.’s newest hero; Science, the teenage gangbanger/shooter, who needs to keep Roy quiet about what he’s seen; Mayor Miguel Santiago, who finds himself facing accusations that he’s just had his opponent whacked; Albert Budin, Roy’s onetime mentor and one of the scariest, creepiest characters in recent crime fiction; and myriad criminals, politicians, and cops who all need Roy to disappear—preferably forever. Finally, meet Scott Frank, who has created not just one of the most entertaining novels of the year but also one of the most surprising. This first novel is fun and funny as well as moving and textured, nuanced and powerful. 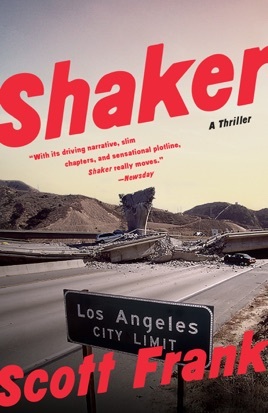 Shaker is the debut work of fiction by a major new storyteller. Screenwriter Frank's well-plotted first novel will remind readers of Tom Wolfe's novel The Bonfire of the Vanities. Hit man Roy Cooper flies from New York to Los Angeles to kill someone five days after L.A. suffers a major earthquake. The hit goes smoothly, but as Roy is searching for his rental car in North Hollywood, he sees three street kids, "none older than fourteen, fifteen tops," taunting an old man in an alley. Roy intervenes, but he can't prevent a kid armed with a .25 from shooting the man dead. The murder is caught on video, and the identity of the victim a mayoral candidate viewed as a legitimate force for reform gives Roy, who was wounded in the encounter, a higher profile than he'd like. Frank integrates Roy's story, complete with flashbacks, with that of Science, one of the young thugs, and of Kelly Maguire, an LAPD officer with a reputation for racism, along the way revealing their inner lives in impressive psychological detail.